Babies can see when they are born, but their eyes don’t always focus accurately. A baby’s eyes may squint sometimes (they may not always line up with each other), but this should be investigated if this reoccurs. Their eyes develop gradually, and after about six weeks they should be able to follow something colourful or interesting with their eyes. An easy test you can do at home when a baby is over six weeks old is to see if your baby’s eyes follow you around a room. If they don’t seem to be able to focus on you properly – for example, if they can’t follow you and recognise your facial gestures, or if their eyes wander when they are looking at you – it could suggest a problem. You can also try covering each of the baby’s eyes in turn. If they object to having one eye covered more than the other, they may have problems seeing out of one eye. As they get older, start to point out objects both close up and far away. If they struggle to see the objects, please don't hesitate to contact us for advice. Some children, usually 4 - 5 year olds, may have vision screening performed at school. However, the earlier any problems are picked up, the better the outcome. If there are problems and they are not picked up at an early age, the child may have permanently reduced vision in one or both eyes. If you have any concerns about your child’s eyes, or if there is a history of squint or lazy eye in the family, please do not wait for the vision screening at school. We will carry out an examination, free of charge under the NHS for children under 16. Your child does not have to be able to read or talk to have an eye examination. Bring your child to D J Dunstone Optometry for an eye examination (sight test), which we carry out free of charge under the NHS for children under 16. For children (for a limited period) the taking of a digital retinal image (photograph) will be free of charge and Optical Coherence Tomography (OCT) retinal scans, if required, just £15. Please click to take a look at an infographic on the stages of development of your child’s eyes or watch a video with your child to find out what happens during an eye examination. Click here for further information about the problems children might have with their eyes, including lazy eye and colour deficiency. 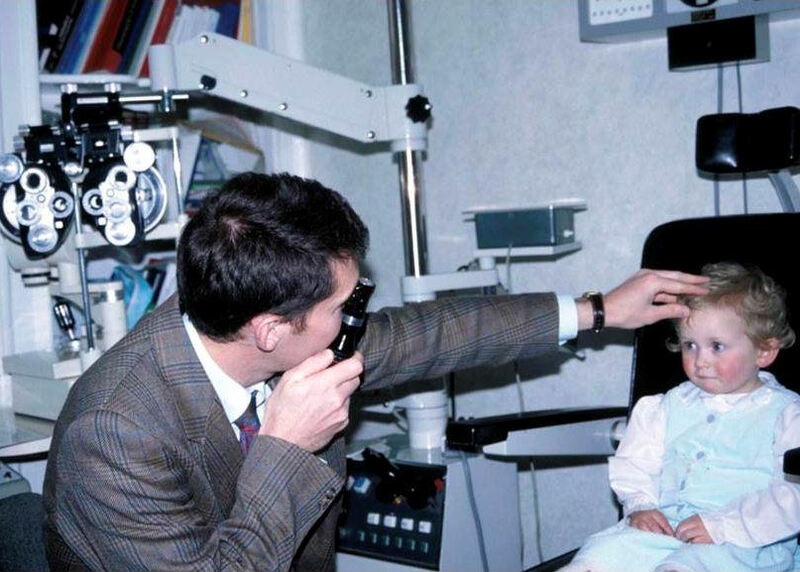 It is recommended to bring children in for eye examination between the age of between 3 and 4 years of age or sooner should you suspect a problem with vision or if there is a family history of sight problems. Please contact us on 01473 823755 if you have any questions or to make an appointment. Optometric assistance often possible for children struggling to read. This can involve screening for Meares-Irlen syndrome (coloured overlays). What to do if your child has been diagnosed with dyslexia, having difficulty reading or if they are suffering from print "moving on page"? It is possible they may require a cloured overlay or corrective glasses to aid them with reading. The first step is to attend for an NHS eye examination to ascertain whether the eyes are healthy, working well together and spectacles not required. Depending on the symptoms and/or difficulty reading we can then consider screening for Meares-Irlen syndrome (ie whether coloured overlays or tinted spectacle lenses are required to assist reading). We can either refer the child for these additional tests to be carried out on the NHS at a local eye clinic or we can perform these tests at a private fee of £60. At our Practice we screen for Meares-Irlen syndrome and supply coloured overlays when necessary and if these prove beneficial then we refer the child to another local optometry Practice that has a Colorimeter (instrument for ascertaining spectacle tint colour). Alternatively, you could take the child directly to an Optometry Practice that has a colorimeter e.g. Kites (Berners Street, Ipswich) or Eyepractice (Woodbridge). Trusting this information is of assistance and we look forward to you booking your child in for an eye examination if you would like our advice.